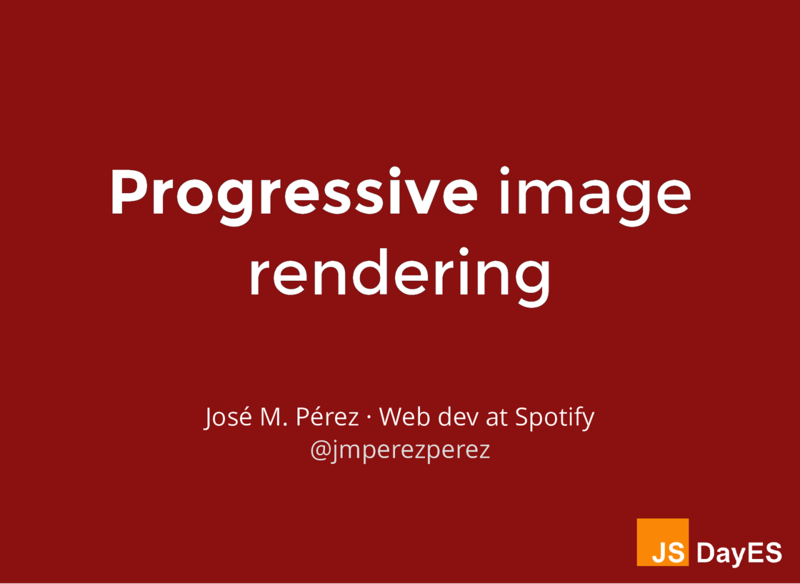 PROGRESSIVE IMAGE RENDERING @jmperezperez What about images? PROGRESSIVE IMAGE RENDERING @jmperezperez PLACEHOLDERS Options Nothing Placeholder Solid colour Progressive image loading or "Blur-up"
PROGRESSIVE IMAGE RENDERING @jmperezperez With the Progressive JPEG method [...] cognitive fluency “ is inhibited and the brain has to work slightly harder to make sense of what is being displayed. — From Progressive image rendering: Good or evil? PROGRESSIVE IMAGE RENDERING @jmperezperez Facebook “ Unfortunately, the standard JPEG header is hundreds of bytes in size. In fact, the JPEG header alone is several times bigger than our entire 200-byte budget. However, excluding the JPEG header, the encoded data payload itself was approaching our 200 bytes. PROGRESSIVE IMAGE RENDERING @jmperezperez Summary Reduce requests Choose the right format and optimise Embrace responsive images Try to lazy load Innovate! PROGRESSIVE IMAGE RENDERING @jmperezperez The Web is fun fun..
View Progressive Image Rendering on Notist. On a regular web page, images represent the largest assets. We might have heard about responsive images to serve the most suitable image for each screen. However, how and when we load them can have a great impact too. I will show you several techniques used by well known websites, based on placeholders, dominant colours, blurry images and lazy loading to improve user's perceived performance. These techniques leverage several web technologies like CSS3, canvas and the recent IntersectionObserver API.